● Check out the Clearance section of the website to shop items that have been discounted by up to 75%. ● You can receive samples of any wallpaper for just $2, with no shipping costs added. ● Free delivery is sometimes offered, with a minimum purchase. Previously, free shipping was given on all orders over $50, while a flat $5 fee was charged for all orders under $50. 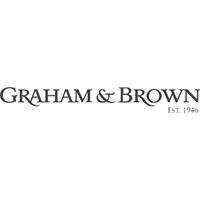 Graham and Brown offers home décor items, wallpaper, art and other items for the home. This company was established in 1946. They offer free shipping on orders of $50 or more. They also have a special program for trade customers. Registration for trade customers is required. There is a toll free number posted on the landing page to reach customer care. There is a scrolling banner in the middle of the homepage that announces sales and discounts that users can click on to navigate to the sales. There is a search box at the top corner of the landing page and a language selection menu. For most up to date offers check out Graham & Brown on Facebook and Twitter or contact Graham & Brown Support for any questions.